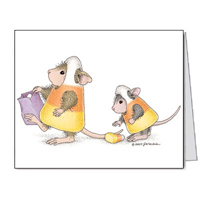 Our Halloween cards are printed with a matte finish on our cream colored paper stock.. This stock brings out the color contrast and text clarity while giving way to a smooth finish. Each card measures 4 1/4" x 5 1/2". Cream colored envelopes included.